"Thrilling experience" seems a bit of an understatement after the headline proclaimed "Panic Reigns During Ship's Race for Shore Against Death in Flames for All!" 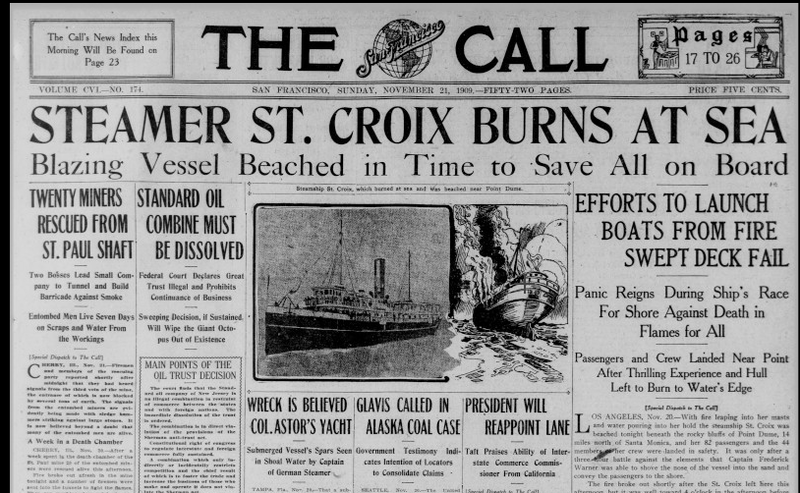 The steamship St. Croix sank off the coast of Point Dume 108 years ago this November. The incident is almost entirely forgotten now, but the dramatic disaster was headline news in 1909. Readers all over the country were left breathless with colorful accounts of the trials and travails of the 44 crew members and 82 passengers of the ill-fated ship. Everyone, from the captain to a six-month-old baby, was extensively profiled. "I lost the ship, but thank God I did not lose a life," Captain Fred Warner is reported as saying. The baby, described as the “six months old heroine” of the wreck by the Los Angeles Tribune, offered no comment, but she, and a small white terrier named Sweet, who also survived the wreck, each had their own 15 minutes of front page fame, and the story remained a sensation for weeks. 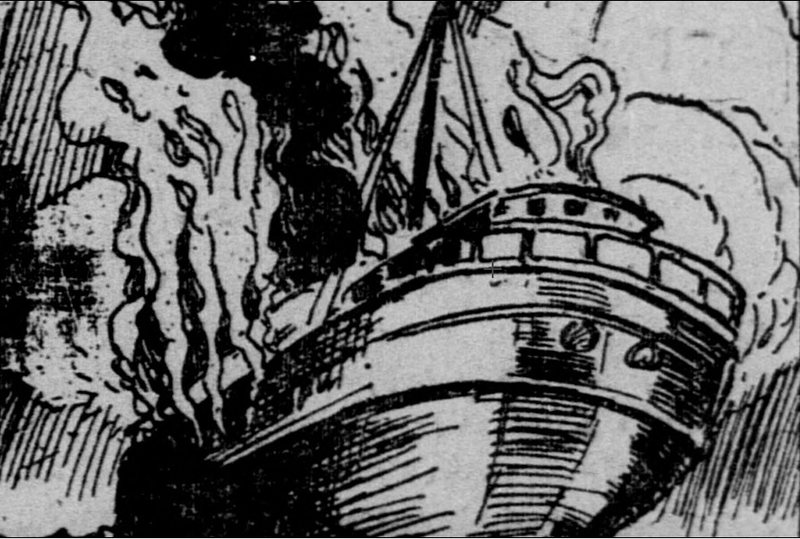 A detail of the artist's depiction of the St. Croix in flames from the San Francisco Call. “Liner afire at sea, none alive aboard...[steamer] City of Topeka reports steaming around burning vessel in fog and finding no signs of life,” a New York Times headline, dated November 20, 1909, states. 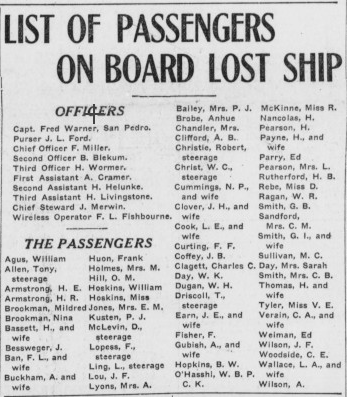 The passenger list for the last voyage of the St. Croix. The November 20, 1909 San Francisco Call providing the first report of the survival of the crew and passengers, but reports of the incident varied significantly, with some accounts describing the captain beaching the burning ship and others describing a harrowing trip by lifeboat—nine boats with 15 people in each—through heavy surf to reach “Zuni” Cove. There's a theory that this was Paradise Cove, based on a description of tall cliffs, but the late Malibu historian Ronald Rindge believed that Zuni was Zuma, and that the specific location was near the outflow of Zuma Creek. The Los Angeles Herald's reporter and photographer arrived by automobile with sandwiches and coffee and were rewarded with the scoop on the story. The castaways reportedly burned fence posts and driftwood to stay warm on the first night. However, this photo was probably taken on the second day at the Las Flores entrance to the Malibu Rancho. It's hard to see, but that may be the gatekeeper's shack on the right. Surviving the wreck was only the first part of the ordeal. A number of passengers and crew members were injured during the landing. One woman was caught between the hull of the ship and the lifeboat, crushing her legs. Moments later, she and her six-month-old child were reportedly nearly drowned when the lifeboat was swamped by heavy surf. 15 member of the crew remained behind, and were rescued by the Coast Guard Cutter Perry the following day. The survivors gathered on the beach and tended to injuries that included burns, contusions and broken bones. The Call reported that the first mate climbed the cliffs and walked all the way to the Malibu Ranch house at what is now the Serra Retreat in search of help. The rest of the crew and the passengers spent a wet and uncomfortable night on the beach. In some of the more colorful accounts a rancher with a race car, or alternately a “secret service agent,” was the first on the scene and sent for help. The glow of the burning vessel did attract attention and eventually ranch hands arrived with wagons and mule teams. All of the passengers and most of the crew opted to travel out on foot or by mule wagon, but 15 crew members stayed behind at the landing site and they seem to have fared better than their shipmates. The Coast Guard cutter Perry arrived the next day and transported them, including one crew member who was “severely injured” and had to be carried on a stretcher, to San Pedro. 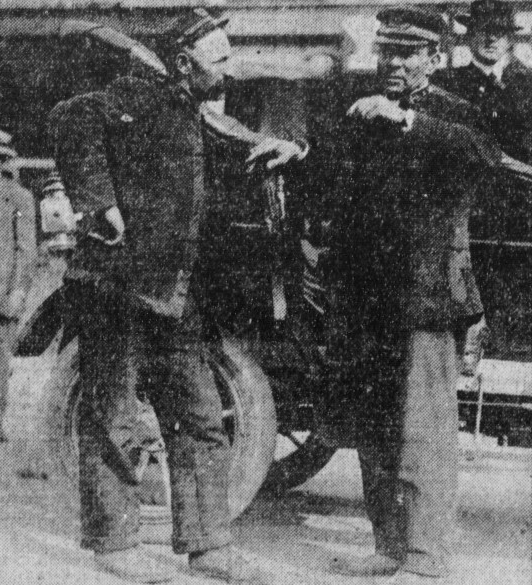 A photo of the St. Croix's exhausted and battered Chief Officer Frank Mills and Captain Fred Warner from the Los Angeles Herald. In contrast, the journey by mule team seems to have been more traumatic for some of the castaways than the shipwreck. The only coastal route through Malibu in 1909 was along the beach. Passage depended entirely on the tides and weather—big surf or high tide could swamp travelers or leave them stranded. One of the St. Croix passengers recounted that the van drawn by the mule team overturned three times. "I guess I'll be all right," she reportedly said. "But I do wish that I could get home. I'm bruised all over." 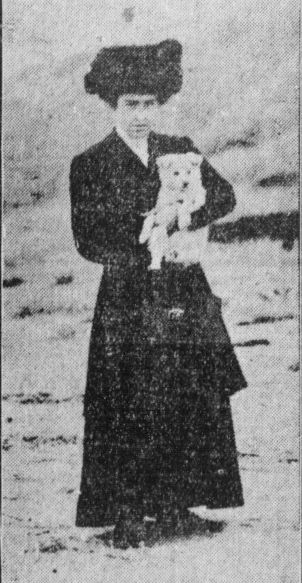 The intrepid Miss Josephine Taylor of Denver, Colorado, with her dog Sweets, who was rescued from the water by another passenger after being thrown from the deck of the burning ship. The castaways appear to have transported all the way to the Las Flores ranch gatehouse, where a bonfire—described in one account as having been made of railroad ties from the Malibu railroad—provided warmth while they waited for transportation back to Santa Monica and civilization. A group photo of some of the St. Croix's rescued passengers, from the Los Angeles Herald. The newspaper accounts state that the steamship company did little to assist the victims, but that the police and fire departments, sympathetic residents of Santa Monica, and the reporters who were among the first to arrive at the scene provided food, clothing, and, finally, transportation for the victims. For the passengers of the St. Croix, the 36-hour ordeal was was finally over. The St. Croix is thought to have sunk in deep water in the vicinity of Dume Submarine Canyon, not far from Pinnacle Rocks. The wreck has never been found. I often think about the St. Croix when November rolls around. I imagine struggling through the surf in petticoats and button boots with a small child in my arms, like the intrepid Grace Thomas. Enduring a cold, damp night on the beach, bruised and burnt and wet, and the long trek out on foot or bumping about on a mule wagon, damp and sandy wool clothes chafing battered and half drowned, along a stretch of coast rarely seen by anyone. I heard about the St. Croix growing up. 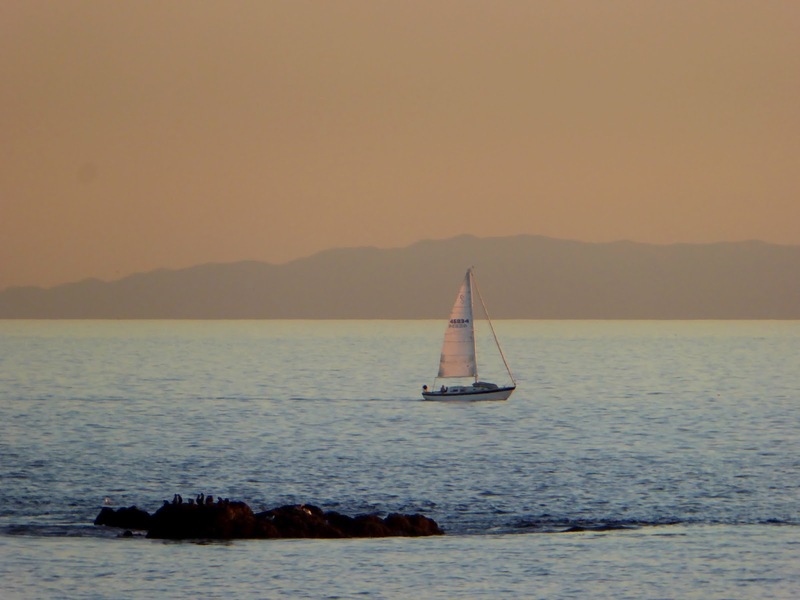 It caught the imagination, and the local divers used to look for the wreckage off Point Dume. I didn't learn the details until I read Ronald Rindge's account in the book of maritime stories he coauthored with Judge John Merrick and published in 2000. I was saddened to learn that Ron Rindge passed away in October. I am so grateful that he generously shared his knowledge of Malibu and its history and stories with all of us throughout his long life. Thank you so much, Mary! It's great to hear from you! Many are lost, few are found but abandoned. Thank you for sharing it with us.